The House of Commons needs someone to preside over its discussions, sort of like a referee. 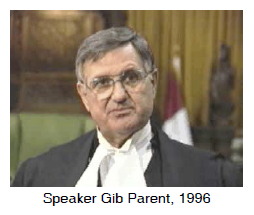 This person is called the Speaker and it's the Speaker's job to decide on proper procedure, maintain order in the House, and manage the House of Commons staff. The Speaker is supposed to be impartial and is elected in a secret ballot by all the other members of the House. Speaker Gib Parent explains the workings of government in "How Laws are Made."